This is the distance between the center axle of one roller to the next. So the larger the roller center distance, the more spread out the rollers will be. Which distance you choose should depend on the size of the load you are wanting to convey. By rule, there should always be at least three rollers underneath the load that is being conveyed. If there are multiple sizes of packages, roller center spacing should be determined using the smallest of them. 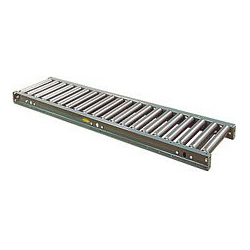 Roller conveyor is available in 5 foot and 10 foot lengths for straight sections. The length of the conveyor along with the number of supports underneath greatly determine its load capacity. 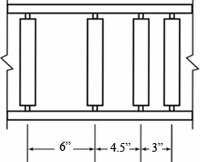 In most applications, supports should be placed in either 5 or 10 feet intervals depending on the weight of the product you are conveying. 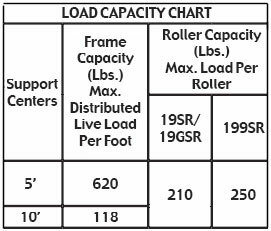 By installing a support every 5 feet, capacity of that section increases greatly; keep in mind though that no matter how close together you place supports, the roller axles themselves also have a capacity that should not be exceeded.